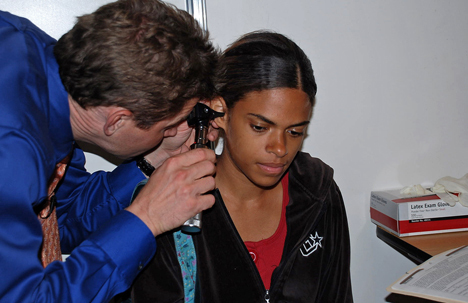 Dr. Jeff Thill examines Geannie Figuereo at Shepherd's Hope Health Center, a clinic that serves uninsured residents in Orlando, Fla. A UMNS file photo by Tim Griffis. 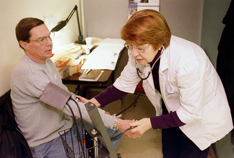 Nurse Maureen Whitsett checks Rick Schultz’s blood pressure at the Volunteers in Medicine Clinic in St. Charles, Mo. There are many faces in the debate over health care we will never see: the mentally ill cast out onto the street to die, the child victims of third-world infant mortality rates in U.S. cities, the unemployed men and women who wait too long for cancer diagnoses. Tracy Smith is one of those people, one I will never forget. In his late 40s, Smith would sit in his car with heart pain while his two beloved young children played in a Seattle park without him. Lacking insurance, Smith suffered rather than endure the indignity of facing a doctor whose first test would be the financial one of how he would be able to pay for treatment. He finally made it to the hospital in time to be treated for near-fatal atrial fibrillation. But he still did not have the insurance or the $50,000 to pay for the heart transplant he needed. His only hope was to wait for Medicare to approve the funds for the operation. He died waiting. Many Americans are still waiting for a health care system that is not dependent on one’s ability to pay. In 1993, not long after Smith died, the hopes of many who consider health care a human right faded away when an ill-conceived effort for universal health care failed in Congress. Now, for the first time in a generation, there is real hope that the United States will make health care a right for all its people. Karen Welch takes a patient's electrocardiogram at a faith-based free clinic in Eureka Springs, Ark. A UMNS file photo by Suzie Bell. President Obama is leading a national dialogue on universal health care, attempting to transcend the political differences and economic self-interest that sidetracked earlier efforts. No one doubts that over the next few months, lobbyists for doctors, health care companies, insurers and drug manufactures will make sure their voices are heard, often placing their own financial well-being over the common good. Never has it been more important for religious voices to be heard. In an effort to contribute to the dialogue, United Methodist News Service invited several church members, from one of the nation’s most prominent health leaders to doctors and nurses on the front lines, to offer their reflections on how to heal our nation’s health care system. Each of them reminds us to look beyond ourselves to recognize the suffering of others under the current health care system. Irma Clark, a Chicago nurse, talks about the pain experienced by millions even as the health care debate moves forward. “There is a lot of pressure when you have to decide whether you should buy a loaf of bread or fill your prescription for blood pressure medicine, and you need both,” she writes. New ideas, new approaches are a moral imperative, they say. Dr. Dan Bell, who co-founded a free medical clinic in Eureka Springs, Ark., proposes the creation of a Federal Dental Corps because multiple medical problems are spawned by bad teeth, and dental care is harder to get than medical care. Dr. Scott Morris, a family physician and executive director of the Church Health Center in Memphis, Tenn., says the health care system must lose its love affair with bigger and better technology and direct resources toward developing general practitioners. Their voices alone are not enough, however. The nation and the church also need to hear from you. We invite you to join the dialogue by posting your thoughts and ideas on the end of this story or any of the stories in the “Healing Health Care” package. The Rev. Linda Walling, executive director of Faithful Reform in Health Care, remembers that not everyone headed for the exits when the Clinton plan failed in the early ’90s. The United Methodist Church and the United Church of Christ never gave up, she said. The memory of Tracy Smith and millions of others on the side of the road of the nation’s health care system will not let us. *Briggs is news editor of United Methodist News Service. News media contact: David Briggs, Nashville, Tenn., (615) 742-5470 or newsdesk@umcom.org. Q+A-Where does healthcare reform stand in US Congress?